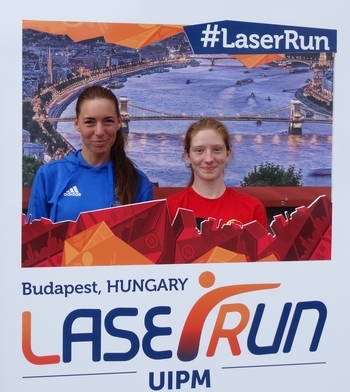 Two of the world’s leading pentathletes played a supportive role as Hungary staged its first Global Laser-Run City Tour on June 2, 2018. The event took place in the heart of Budapest on Margaret Island, a beautiful green space in the centre of the River Danube. The venue was the Margitsziget Athletic Centre, which hosted the 1999 UIPM Pentathlon World Championships. Robert Kasza, currently world No.1 in the senior men’s pentathlon rankings, was joined by women’s No.3 Tamara Alekszejev in adding star quality to this latest edition of the UIPM’s fastest-growing development event. Qualification for the 2018 UIPM Laser-Run World Championships in Dublin (IRL) was at stake for those who took part. Although this was the first major Laser-Run competition in Hungary, there will soon be opportunities to build on the momentum created in Budapest on June 2. A Laser-Run event is to be held during the 2018 European Modern Pentathlon Championships in Székesfehérvár and then in 2019 the UIPM Laser-Run World Championships will run alongside the UIPM Pentathlon World Championships in Budapest. Gyula Karácsony, head shooting coach of the Hungarian Modern Pentathlon Association, said: “All Laser-Run competitions are useful and this Global Laser-Run City Tour was a good experience for youth and a great training opportunity for the seniors.